If you are on the look-out for a gun safe that features electronic locking system and lightning fast access, then a biometric unit might have all the bells and whistles you’ll want in a gun safe. With a biometric unit, you will be able to reach your gun in matter of seconds. The majority of biometric device are smaller than average and you will be able to carry them wherever you are going. 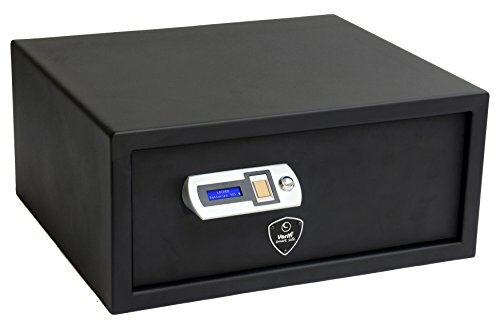 A biometric gun safe might also serve you well as an ideal option if you are traveling or looking for unit that perfectly fits your car as almost every biometric type will smoothly fit under most car seats. In addition, you will be able to access the safe easily in dark situations. You can gain access to a biometric unit by entering a code, or you can access it with your fingerprint (depends on model). Biometric safes are battery powered and most of them include an AC connector for you to plug into the wall. The AC connector will increase the life of the battery significantly. Below, you will find the best biometric gun safes for sale today. Chances are you’ll recognize a number of the choices below from car gun safes. However below you will find more detailed information, so you can be sure to end up with a safe that meets all your requirements. 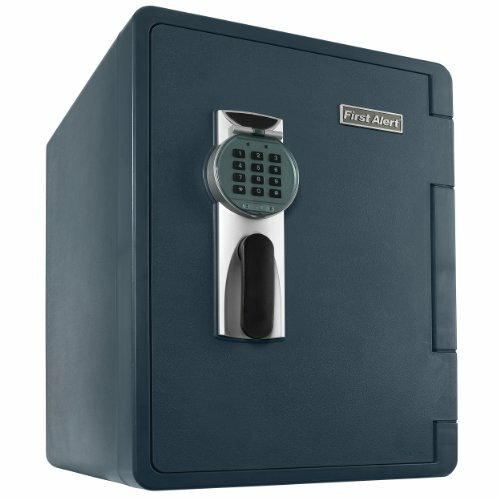 2 Biometric vs Manual Gun Safe? Here we have an extremely compact and neat gun safe from Sentry Industries. Even though it’s a bit smaller than other safes on the market, there is plenty of room to store a full-sized handgun inside. It includes a Pry-resistant top lid that is designed to keep burglars from cracking-it open. It’s incredibly easy to access the safe with just one hand. Since its equipped with a quiet hardware, you can easily gain access without ever being heard. This one is also brilliantly equipped with gas struts that will open the door and keep the door open until you decide to close the safe. I did mention that this model has enough room for most handguns but its good idea to measure your pistol before you buy. The measurements are: 2.2″by 9.7″by 6.6″ and this should be sizeable enough safe for most standard handguns but be aware that there are many bigger pistols that exceed 2.2in for sale, so be on the safe side and have all the measurements of your handgun crystal clear. The Sentry is amazingly Lightweight gun box with low profile design and weighs only 11.9 pounds (5.4kg) so you will have no problem carrying it around. You can hide this box anywhere in your house. It will blend in perfectly with your books in a bookshelf or in your car. Although this container weighs just few pounds and is compact, it doesn’t mean that it is poorly designed. It features a massive steel material. The whole unit is made out of durable12-gauge steel and will make a real headache for anyone who intents to pry-it-open. Moreover, there is no way for a thief to insert any tools to crack it open as the lid has a low profile design. Any burglar will need a lot of time and sophisticated tools if the intention is to break into this mini-vault. This is a finger-print safe, and you might think it’s difficult to program the safe to your needs. Rest assured that it’s extremely straightforward to program this safe. Just position your finger in the scanner area until you see a green light flash once, then the machine is ready for a different scan of your finger from a different angle. It will flash 3x times when the fingerprint is registered and saved. This is not a poorly designed fingerprint scanner like the cellphone scanners. This particular scanner will analyze every angle of the finger. That way, you’ll be able to position your finger in any way to access it. To power the fingerprint scanner, this unit runs on 4x AA batteries. However, this unit features a back-up access in the event that the batteries dry out. If you run out of batteries, and you can’t use the fingerprint scanner, you have the option of using a keypad to enter digital code or a physical key. This safe is extremely popular among those who want to keep a pistol securely locked up in a vehicle. It is extremely easy to mount it anywhere you desire. There are holes that are already drilled, so you can bolt it down. You’ll also receive all the tools you need for the mounting process. Overall, this is a quality, portable and strongly built gun safe that provides easy access. Sentry Industries are among the top-rated manufacturer on the market, and as such, they will provide you with industry leading customer support and warranty for 1 year in case you run into any trouble with this safe. Next up is the ideal traveling-buddy, the MicroVault XL MVB1000 from GunVault. This one is extremely lightweight and portable. It has enough space for 1x pistol, 1x magazine along with few important documents. It’s a finger-print scan product so you will gain access to the safe very quickly. The fingerprint scan technology allows you to program 120 different prints. This way, you will be able to program the safe in a way that every adult in the home can access the safe if anyone breaks into your house. The interior is packed with carpet material to avoid any damages to your guns. There are also pockets to store important papers. This unit is features advanced fingerprint technology with a brilliant slide-through fingerprint scanner. This is considered a unique feature that no other gun safe company offers. Like with every other model, where you’ve to place your fingertip on the scanner, this one allows you to swipe your finger to access. That way, you will be able to open-up the safe even more quickly in case of an emergency. 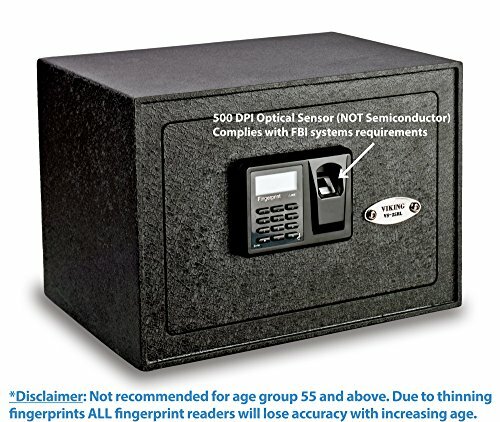 A part from the unique-swipe feature, this unit provides the largest memory capacity among gun safes available today, with up to 120 unique fingerprints. Programming the finger-print scanner is dead simple. All you need is to touch the button on the side, and you’ll notice a green flashing LED light and then a beep. Once it beeps, the scanner is ready to memorize your fingerprint. Once you have programmed the safe, an unauthorized user will not be able to add his/her fingerprint without your permission. This is because once you store your fingerprints for the first time, you will become the administrator or master. Therefore, if someone tries to add a new fingerprint, the “master” fingerprints have to be scanned first. Mounting is relatively easy process with the GunVault. You will get a security cable with your purchase, and you can use the cable to lock the safe properly down. However, you will need to invest further in mounting bolts, as they are not included in the packages. More security features involve the low-profile and tight fit design that makes the door and hinges match perfectly to make it even harder for burglars to pry it open. About size and capacity, the MVB1000 is an extremely lightweight and compact unit. It weighs merely 8 pounds ( 3.6kg), making this unit an ideal portable gun safe. It measure 3.5″x10.25″x12″ and will easily fit anywhere in your house or in your car. The MicroVault is designed to hold a standard handgun and there are pockets in the inside that are for important documents or small personal items. Sturdy, but soft construction made entirely from 18-gauge steel. 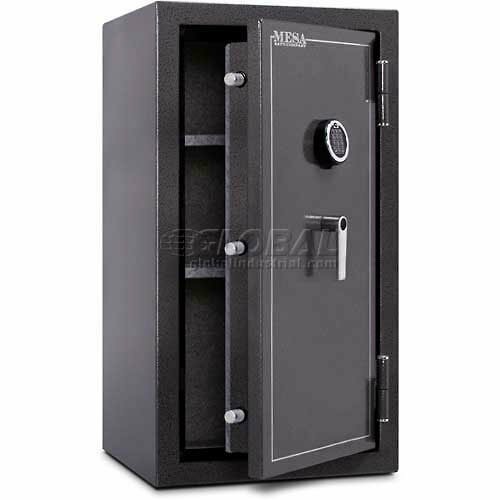 With this top-quality steel frame, any thief will have major difficulties breaking into the safe. On the inside, it’s padded with foam to ensure your pistol stays in place, and the foam is to prevent any damaging that might occur. Like the majority of biometric types, this one has a back-up entry. However, this one does not run on AA batteries but features a 9V battery that will hold a charge much longer than 4x AA batteries, but they won’t last forever and they can dry out just as the AA batteries. If you run out of batteries, you will be able to access it through a key-based lock. Overall, the Gunvault company is known for their industry-leading customer support and they are offering a whopping 5 year exclusive warranty with this product. They stand-by their products 100%, and you won’t get a 5 year warranty for a biometric model from anyone but GunVault. Next on our list is the AX11556 from BARSKA. What we have here is a brilliant gun safe that was primarily designed to fit into smaller furniture spaces like drawers. To open-up the safe, the lock will scan your fingerprint, and it will store up to 30 different prints. There are already drilled holes for you so you can easily mount it anywhere you like (mounting tools are included). Keep in mind that this safe opens from the top. This safe runs on 4 AA batteries but if they dry-out, you will still be able to open it with the 2x back-up keys that you get with your purchase. In case you run into any troubles with the safe, you are backed-up for a year with the warranty. This model is extremely compact and measures 14.75″x11.25″x5″ and the weight is only 21 pounds (9.5kg). 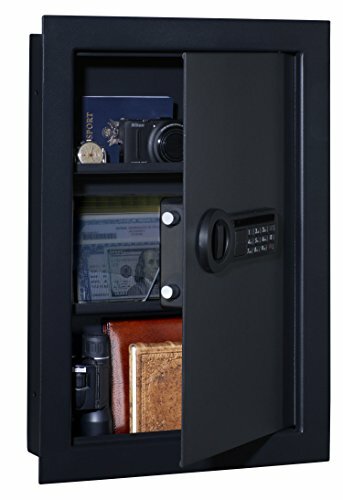 Although this safe is lightweight, you will be able to store 2x pistols inside and your important documents. I did mention that the safe can register up to 30 prints, and this is an ideal option for those who like to allow more adults to access the safe. The scan process is dead-easy, and you’ll need to put your finger on the scanning area, and wait few seconds. You can always refer to the user manual if you run into any troubles programming the fingerprints. All instructions in the manual are well organized and easy to understand. 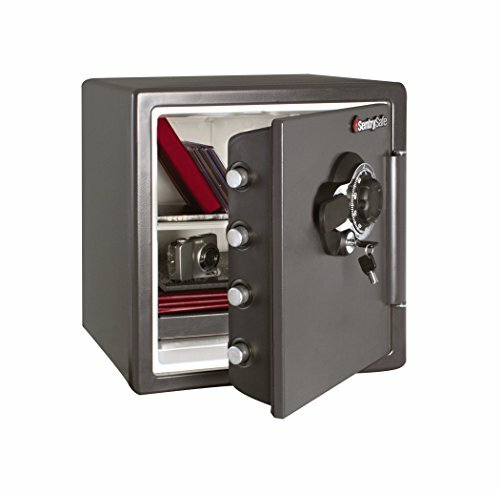 The whole safe is built from 1/16″ top-quality steel and the lid from 3/16″ steel. Moreover, the locking system features 2x sturdy steel dead-bolts. This will give you extra level of security. It is recommended that you bolt the safe down by using the two pre-drilled hole and the mounting bolts. 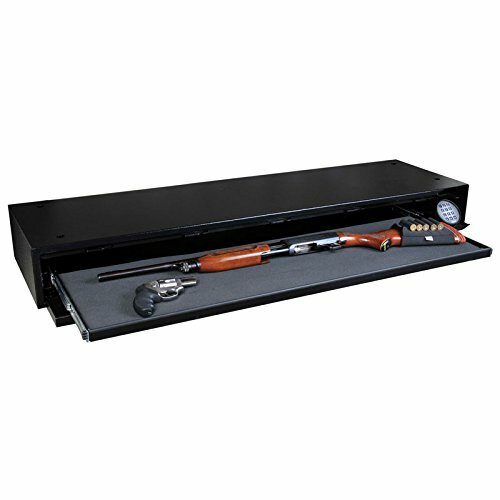 If you are searching for a compact and easily accessible gun safe that you can store under your bed or in your drawer, then you should see if this unit fits your style. However, have in mind that this safe does not open at the front (like most gun safes). For that reason, this is the number-one pick for those who are looking for a drawer gun safe. It is spacious, constructed from thick steel and very reasonably priced. On top of that, the Barska team will offer you 1-year warranty on the product. You might already know that a biometric type is battery powered. However, there are so many items for sale that won’t give you any sign that the battery is running out. With the GVB1000, it will let you clearly know by beeping, and it features modern light signal that will let you know when you should consider changing the battery. Having said that though, I advise you to use a AC adaptor if you can, to extend the battery life even further. The interior is beautifully covered with foam to protect your pistol from any dings and scratches if you decide to take the gun safe with you out of the house. Warranty is something you should also look-into before you purchase, and the GunVault team will offer you a fantastic 5 year exclusive warranty on their product. This is among the best value warranty that you can get for a gun safe. You’ll be able to program upto 10 fingerprints if you want others to access the safe. Once you open it up, you’ll see all your contents clearly, because the unit has small light bulb so you can easily see everything inside once you open. This is ideal for those who want to access it quickly in a dark situation. This safe is built to be longer lasting gun safe than others on the market, mainly due to its thicker steel material. It features 16 gauge steel and will resist heavy beating and break-in tries so it will take more time for a dedicated burglar to crack the safe open. All this top-quality heavy-duty steel weighs around 9 pounds. To increase the security even more, this safe features a tamper indicator. That is to say, when too many invalid attempts have been entered, the safe will block any further attempts. Once the tamper safety has been triggered, you will only be able to access the safe with the back-up keys. After you use the back-up keys, the tamper mechanism will reset. This is excellent choice for those who are looking for easily accessible biometric fingerprint scanner safe and hassle free programming instructions. You won’t have to memorize any complicated codes, and you can rest assured that only your fingerprints can be used to open the case. 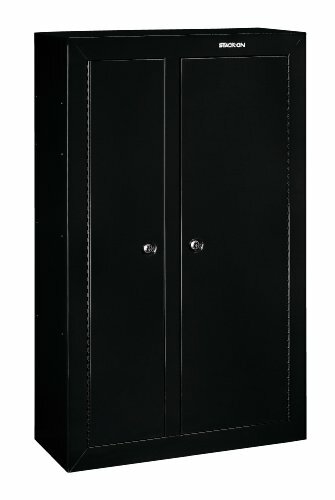 This unit is among the most popular gun safe sold today. With it stylish look, the GunBox will fit beautifully among any of your household furniture. The streamlined form of this gun safe provides you with more durability and fire-protection than any other portable biometric unit being sold today. There are so many great features hidden in this GunBox that it would take forever to go through all of it. There are multiple ways to access the safe as this safe features fingerprint scanner, but also it has a Radio Frequency Identification. This RFID technology can be attached to a sticker on a card or attached to a wristbrand. You might recognize The Radio Frequency Technology from so called tap-and-go credit cards. Moreover, it is also widely used as a key-card opener in many modern hotels nowadays. You can disarm the RFID receiver if you prefer (if you are worried that your kids might find the card). As soon as you disable the RFID, the finger-print scan will activate and become the primary key-opener. If all electronic system fails, or runs out of batteries, you can still access the safe easily. If you have a power failure or dry out the batteries, there is a tiny screw located at the back of the safe that can be used to open it. You will be able to use a specially designed tool to remove the screws, and the safe will open up. It’s rather simple to program the finger-print scanner, and you’ll have to place your fingertips on the reader and allow the safe enough time to scan and register your print. Easy process that takes few seconds to complete, and you will need to scan all the angles of your finger. You will be able to store up to 100 prints in the memory. 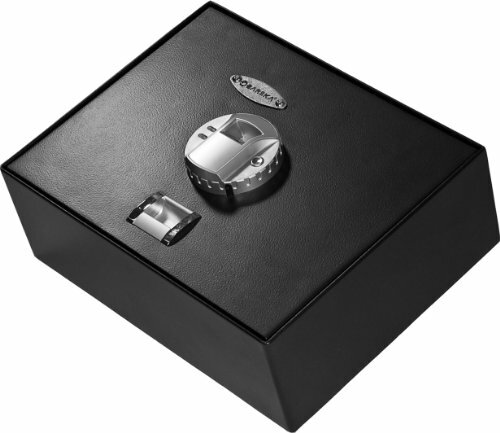 This GunBox safe is extremely durable. Although it is compact, its body is made from top-rated steel. There are so many compact gun cases for sale today that are just made of thin steel and can easily be cracked open just by hammer the unit to a concrete floor. However, that’s not the case with this storage unit. On the inside, it is covered with neoprene that will keep your pistol in place and prevent any dings and scratches. Durability and strength are something that the GunBox team had in mind during the production period. This monster is biometric scanner is constructed from durable, top-notch steel, so the level of security is top-notch with this safe. To enhance the security even more, an alarm will notify you as soon as someone tries to tamper with the locking mechanism. In summary, this GunBox unit is by far the most tech friendly unit that you can get your hands on and you can use it in so many ways. Take it with you when you leave the house, store it in your car or just store it anywhere at home and make it blend-in with your furniture, thanks to the sleek and stylish look. It’s a unit that you can truly count on. 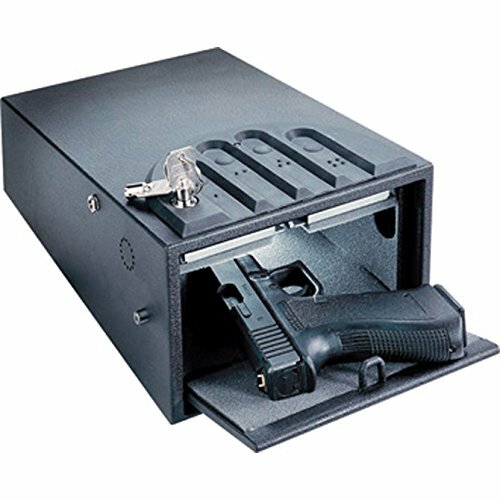 It is extremely durable, reliable and probably one of few best compact gun safe you can invest in today. 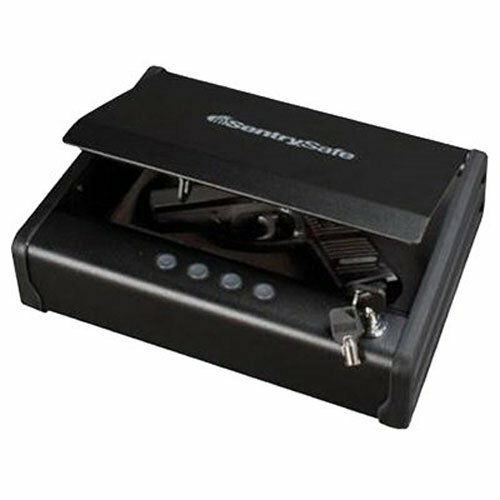 Here we have a sturdy safe that you can open with your fingerprint and runs on 9V battery. 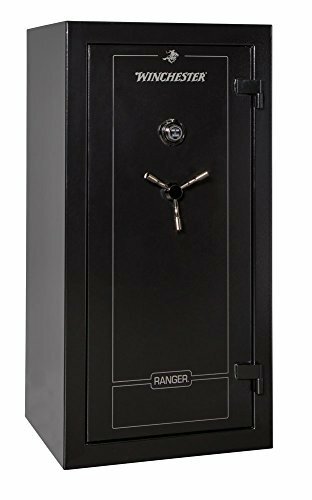 Heavily constructed nine gauge 3mm steel make this safe extremely secure and highly sought-out gun safe. It brings together security and accessibility as this unit includes a keyless system that incorporates a finger-print scanner to unlock the safe. Although that this safe is compact, it’s extremely sturdy and this unit is perfect to securely store your firearms. It measures 14”x10.2”x4.6”, giving you plenty of space for your pistols and other valuable items you might want to securely store. It’s beautifully padded with foam on the inside to make sure that your pistols won’t scratch. Equipped with 4x pre-drilled mounting holes and includes 1x 9 volt battery and 2x extra set of keys. You won’t have to worry about running out of batteries, as you will get 2 back-up keys to use if they dry out. Maybe you’ll want to authorize others around the house access to the safe, and in that case, you can store up to 10 different fingerprints. This gun safe features quick access using the fingerprint identification. Constructed from durable, top-rated materials and exceptional quality that will provide you with security satisfaction, knowing that all your valuable items are securely stored inside. As you know, there are so many gun safes out there that offer extremely high amount of fingerprint storage, but this unit offers you more than enough prints. If you are on the look-out for a sturdy, compact biometric fingerprint that will provide you with exceptional craftsmanship and high tech locking mechanisms, then this could be an excellent choice for you. It’s very reasonably priced and offers fantastic value for your buck. Biometric vs Manual Gun Safe? In short, a gun safe is a secured safety containment that will allow you to safely store your weapons, ammos and/or important documents. The main purpose of a gun safe will be to secure your weapons from any unauthorized individual from accessing the safe. Moreover, it will protect our young ones from injuring themselves and it will protect your loved ones from intruders. Gun safes come in all sizes and shapes. It can be the size of a huge closet, or as compact as a small bag. You’ll find so many different shapes and sizes for sale and what the most popular ones are manual, mechanical and biometric. To access this type of gun safe, you’ll need a physical key and/or work with a combination locking mechanisms by entering digital numbers. The main advantages of manual units are that you can open it using a special physical key or by entering digits on a keypad. The main drawbacks are that you won’t be able to access the safe as quickly as with biometric safe. Who knows in what state your mind is once you realize that there is a burglar in the house. You rush out of bed, and in panic you forget the combination code, forget the digit sequence or desperately looking for the keys to the safe. Now, let’s turn to biometric unit and find out what type of safe it is. 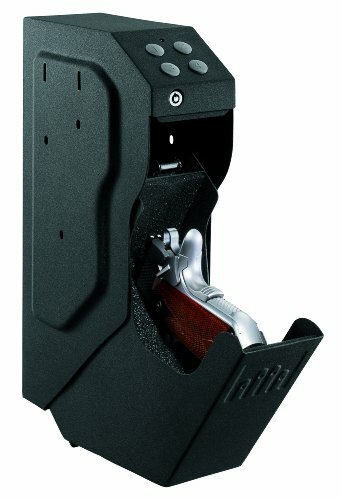 When we are talking about a biometric type, we are talking about a compact gun safe. More compact than the usual heavy cabinet sized gun safes that are not designed to take with you out of the house. However, the biometric versions are portable. They are much smaller, and they can be traveled with easily. Therefore, it is easier to steal a biometric unit than a traditional cabinet gun safe simply because they are more portable. However, keep in mind that although it might be easier to un-bolt biometric safes, it doesn’t mean that it is easier to pry-them open. It uses finger-print scan technology to open. There are no keys, no digits to remember. There are many types of biometric items on the market, and all come with different a fingerprint scanner. Some models will allow up to 10 fingerprints, and others offer up to 100 different scans. The main reason for the huge popularity of biometric units is the fingerprint technology. If you are in risky situation, it’s possible gain access to the safe in matter of seconds by scanning your fingerprint and gain access to your weapon, even in dark situations. Furthermore, another benefit is the compact size of this kind of safes. They fit almost everywhere. You can store it under your bed, in the closet, in the drawer or even stash them as household furniture as some of them have modern and stylish design that blend well in as a furniture. It goes without saying that if a burglar is determined to pry-open a safe, he will most definitely be able to do so if he has enough time. For gun safes with traditional lock system, it will become an even easier task for a thief to access your safe. Moreover, children around the house could easily memorize the combination and open up the safe. However, if you select a biometric unit, you will take security to a completely new level because biometric safes feature a fingerprint scanning technology. By registering your prints, rest assured that only individuals that have scanned their prints will be allowed access the safe. Moreover, having the ability to use a fingerprint to open up a safe will take seconds while, on the other hand, a safe with a different kind of locking mechanism will take significantly longer time to open. This is the main advantage of having a biometric safe, you can open it effectively in just seconds if there is an emergency. There are many models for sale that allow you to program several fingerprints. The quantity ranges from 10 different prints upto 100 on some devices. Another great benefit of biometric safe is that you won’t have to waste time looking for the key and wasting time trying to remember the combination to your safe. If someone breaks into your house, you’ll need to access the safe as quickly as possible and to access it as quickly as possible, a biometric unit is the perfect solution. Without having to worry about keys or combination, you’ll have to place your fingertips on a scanner and the safe will read your prints and open up right away. A unit that will open in matter of seconds will offer significantly more security to you and your family, than a safe that you’ve to remember the combination or waste time looking for a key. Of course, these types are not perfect and they do require some source of power to function as 100%. Some models run on batteries, and batteries can dry-out when you really need access to your guns. Nevertheless, biometrics have a back-up entry as they all include master-keys. Moreover, some models are equipped with AC adapter that you plug into the nearest outlet. Some of you might think of it as a drawback that they are quite pricey if you compare them to ordinary safes. Having said that, it’s important to take into account that it is always better to go the extra mile and fork out a little extra cash. You are most definitely paying for quicker access and quicker access in an emergency situation is hard to put a price on. In case a burglar breaks into your house, every second counts and you need quick access to your weapon. It is better to pay a little bit more for quicker access than having to struggle with keys and combination in a risky moment. At last, the question remains, why should you even consider a biometric one? As I did mention above, there are some great advantages to biometric units. If you want a safe that is easy to use, that is to say, gain access just with your fingerprint. Then a biometric type is your best option. They can be stored almost everywhere and they are portable. They are a bit pricey, but it’s better to invest a little more to have quicker access to the safe in an emergency situation. It’s impossible to put a value on something when it comes to protecting your loved ones. Overall, in this article you will be able to spot the best biometric gun safe that fits your style and needs. They range in prices, and I’m sure that you will find a perfect gun safe that won’t break your bank. Biometric unit is definitely something worth considering, as the fingerprint scan is extremely popular and brand new innovation nowadays. It’s all about quick access and of course, biometric models have their drawbacks. However, the advantages clearly overshadow the negative aspects easily. Having said that, investing in a biometric unit could be one of your best investments if you own a gun.